Next time you toss a paperback into your carry-on bag, add a second book to your luggage since the one you finish could possibly either change the life of yourself or the friend you loan it to once you've finished. This is precisely what happened when acclaimed filmmaker Stephen Frears picked up the bestselling novel The Damned Utd by Granta award nominated British author David Peace and then loaned the book to Frost/Nixon, The Last King of Scotland and The Deal screenwriter Peter Morgan at the 2006 Venice Film Festival where they were in town to present their work The Queen along with producers Andy Harries and Christine Langan and actor Michael Sheen. 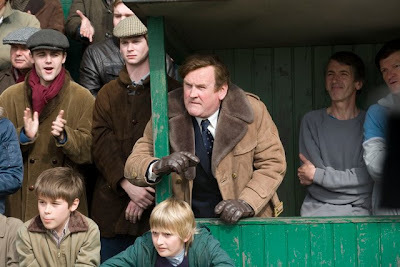 By the time their flight landed back in England, Morgan, Sheen, Harries and Langan had all decided to reunite once again on the big screen adaptation of Peace's book, which chronicled the unforgettable odyssey of former footballer turned coach of Leeds United, Brian Clough who was ceremoniously sacked from his position after a legendary 44 day run. 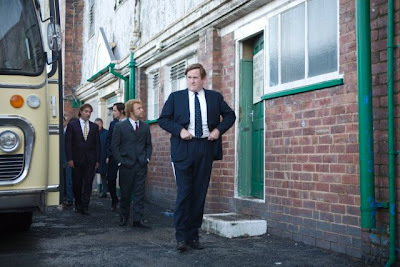 As Frears was committed to Cheri for his next project, the core four turned to Emmy Award winning director Tom Hooper. Fresh off his work with Morgan on Longford and the smash HBO successes of John Adams and Elizabeth I, Hooper helmed the ambitious period piece and the result is another success for not just Morgan and company but especially Sheen who manages to outdo his admirable performances as Tony Blair and David Frost with the man who was the Muhammad Ali of international football (or soccer as known in the states). Although in public, Brian Clough was known as a master spokesman for everything Brian Clough, playing with the media the same way that celebrities and their publicists do today, privately he was a driven man passionately obsessed with turning his early football clubs into division one successes. Moving back and forth in time from pre and post Leeds United to ensure we have a better understanding for the man's motivations or the beef behind the bravado, which initially took some getting used to in Morgan's chronological yo-yo, once you get locked into the rhythm, the fast, furious, funny film proves just as compelling as a world cup match. 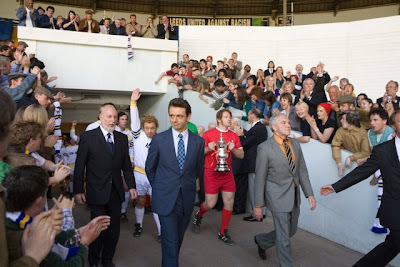 While the ego seems as though it was always there, with Sheen's Clough spending money like mad and sending out his best friend and lieutenant (Timothy Spall) to scout first rate talent in building up a top-notch Derby County team, the film hinges everything Clough would become on one crucial game between his team and the top rated visiting opposition against Leeds United, coached in that era by the revered Don Revie (Colm Meaney). 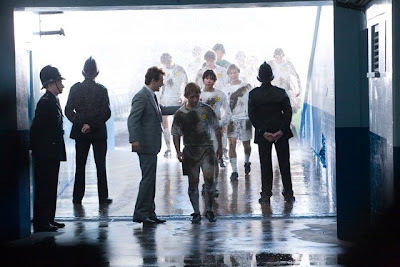 Refusing to acknowledge Clough's presence, shake his hand or have a drink with him to the point that he doesn't even seem to realize that the other team or its coach exists, the slight from Revie is the rotten cherry on top of a spoiled dessert when it becomes apparent that the reason the team is ranked so highly is because they cheat mercilessly throughout their games. Needless to say, his tactics of wanting the footballers to accept their roles as official sports heroes and outdo Revie at his own game and with his own team become a source of controversy as Leeds United fans don't exactly want to come down to the stands to watch their players lose by playing the game according to the actual rules and via sportsman-like conduct. 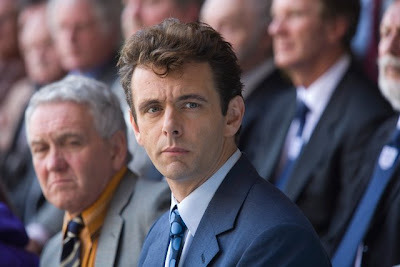 While the underrated Spall is especially heartbreaking as perhaps the only human being on the planet to truly understand Clough in what Morgan wrote like a modern day love triangle, the film single-handedly belongs to Sheen in a tremendous, exuberant portrayal that we never saw coming based on his subtler portrayals of Frost and Blair. Daring, loud, cheeky and charming in a way that fills us with laughter and pathos on an equal scale, it's one of 2009's strongest turns by a male performer but one that was overlooked by the Academy and other awards outlets no doubt because “soccer” or football and the one and only Brian Clough isn't as instantly identifiable to Americans as the previous individuals that Sheen has brought to life. 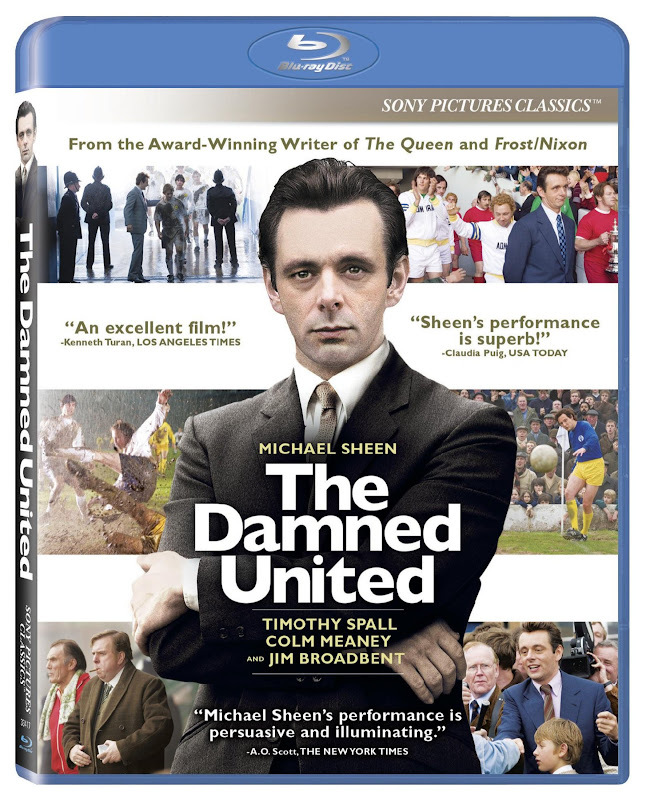 Less a movie about the sport than it is about what drives human beings and how our relationships and our own attitudes about how we gauge ourselves and our values dictate our paths, The Damned United made an instant fan out of this reviewer in Sony's high quality Blu-ray transfer the evened out the rich sound of a stadium's roar, the music of Deep Purple, and the cocky aphorisms of Brian Clough across all 5.1 speakers. Overall, it's a vibrant picture that purposely took a different and lighter approach to certain aspects of the novel in order to make it more compelling in the show me medium. 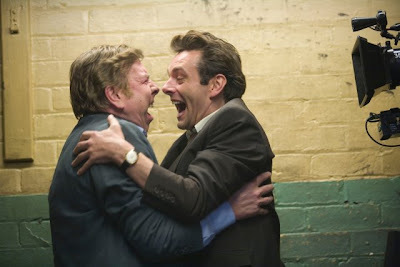 And the fascinating aspect about United is that as impressive as it is in the show me medium of film, it's augmented twice over by the tell me medium of first Peace's acclaimed source material and secondly the way that the purchase and loan of the right book at the right time linked the right people together. In this case, it's similar to the way that the right partnerships and events clicked everything together for Brian Clough's 44 days with The Damned United when a coach took the long road from Derby County in a story you have to see to believe, whether you loan it or buy it.